This Victorian-period aquamarine wedding ring engagement set in 14K yellow gold is the perfect way to celebrate your love and your love for vintage jewelry. 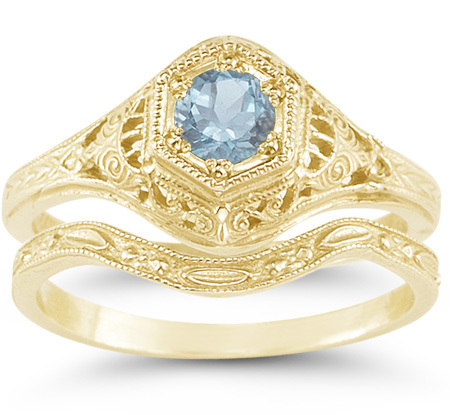 Apples of Gold Jewelry brings you a vintage wedding set that features a soft icy blue aquamarine stone, which is rated A and is 4mm in size, and a detailed set of bands created in 14K yellow gold. The detail of the bands will leave you breathless! For those who truly appreciate history, the rings are exact replicas of the original rings that were designed years ago - and the same jewelry making pieces were used to create them! We guarantee our Victorian-Period Aquamarine Wedding Ring Engagement Set, 14K Yellow Gold to be high quality, authentic jewelry, as described above.